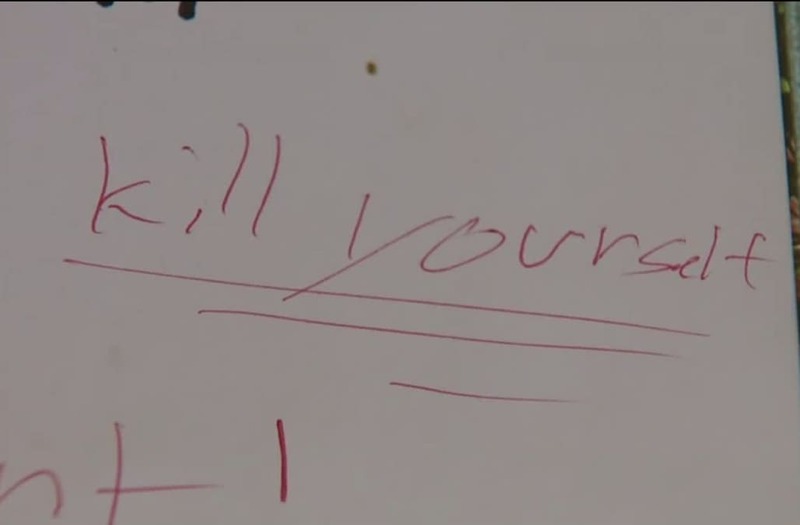 BUCKLEY, Wash. (KCPQ) – A Pierce County mom said she was heartbroken after her 13-year-old son told her he wanted to kill himself after relentless bullying at school. His mom also told Q13 News the boy's classmates wrote hateful messages in his school yearbook, telling him he should commit suicide. The 7th-grader said he would usually try to arrive late to class to avoid his bullies – but last week's incident was too much for him to handle, and he planned to take his own life. "This could have been prevented, you can't ignore these kinds of things," said Shannon, the boy's mother. Shannon doesn't want to share her last name; she also doesn't want her child identified for fear of more bullies targeting him. "Middle school is so rough anyways," she said. Shannon said the bullying reached a tipping point on yearbook day in mid-June when classmates signed her son's album with curse words and misspellings – but most disturbing were the repeated messages telling her son to kill himself. "I can't imagine how he felt when he picked it up from the ground, after it was thrown at his back and saw that, those words," she said. "Absolutely heartbreaking." A mom said she was heartbroken after her 13-year-old son told her he wanted to kill himself after relentless bullying at school. Her son said he then left the school grounds embarrassed and made a plan to end his life. The boy called his mom and told her his plan but she swooped in and found him walking down a road toward the river. "That was the worst phone call of my life." Janel Keating-Hambly, the school district's superintendent, shared a letter with parents about the incident, which was widely reported on social media. "Our immediate concern is for the safety and well-being of the student involved, and school administration has been working closely with the student and their family from the beginning,"Keating-Hambly said in one portion of the message. But Shannon said it wasn't the first time her son has been bullied at Glacier Middle School. Her attorney shared an email with Q13 News that alleges the school knew Shannon's son was being picked on prior to the yearbook incident. Now the family is considering filing a lawsuit against the district. "We hope that by bringing a lawsuit, the district finally understands their legal duties to provide a safe learning environment for kids," said attorney Yvonne Ward. School administrators said both the school district and local police have an open investigation into last week's incident. The district also said next school year it's planning to teach kids the impact and consequences to bullying.